Will there be an OSGeo Desktop shootout at FOSS4G 2010? Delegates who voted for the FOSS4G 2009 presentations ranked the OSGeo comparison projects very highly, which is something I suggest hopeful FOSS4G 2010 presenters take note of, because competition for speaking slots will be fierce. At FOSS4G 2009, 183 quality presentations were submitted, and there was only 85 speaking slots. In 2010 it is likely to be much harder, as there is expected to be 2 to 3 times more delegates and many more hopeful presenters. In 2009 the community ranked potential presentations, and some of the highest ranked presentations targeted the comparison of popular packages. Unfortunately, there were only a few of these types of presentations. The moral to the story is that delegates want to see how different projects compare, and to date we have had a shortage of such presentations (partly because they are a lot of work to set up). However, I strongly suggest that projects start teaming together to put together such presentations for 2010. The tests should not be restricted to Open Source, but be open to proprietary vendors too. 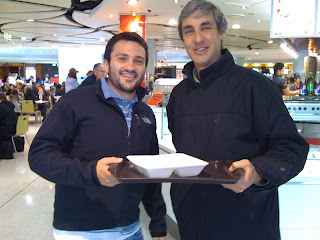 (ESRI and ERDAS were invited to participate in the 2009 WMS shootout, and it seems likely they will participate in 2010). So who wants to participate? We are planning two Arramagong GIS Live DVD releases during 2010 and would like to know what applications and functionality people would like to contribute. A Live DVD, which is regularly handed out at conferences, most recently being given to all delegates at the 2009 FOSS4G conference. The core success of the Arramagong LiveDVD is due to the simple yet powerful build scripts. All that is required for a relevant project to be incorporated into the LiveDVD is to write a bash shell script which installs the application onto an Ubuntu distribution. Hence, our last distribution attracted over 20 developers and from project announcement to a released distribution took under 6 weeks. Then please contact our mailing list at: http://lists.osgeo.org/mailman/listinfo/live-demo or contact Cameron Shorter directly at: cameronD O TshorterATlisasoftD O Tcom. Presentations, videos and posters from the international conference for Free and Open Source Software for GeoSpatial are now online. So if you missed the conference, or couldn't attend all the sessions, you now have a second chance to participate. In particular, I strongly recommend viewing Paul Ramsey's thought provoking and entertaining keynote speech, " Beyond Nerds Bearing Gifts: The Future of the Open Source Economy", http://2009.foss4g.org/speakers/#Paul_Ramsey . Almost all presentations, tutorials and workshop material has been collected, and we have videos of 2/3 of all the presentations. Presentations, workshops and tutorials and videos are linked from abstract descriptions at: http://2009.foss4g.org/schedule/ . FOSS4G is an international Free and Open Source Software for Geospatial conference, which was held in Sydney, Australia, 20-23 October 2009. FOSS4G offered presentations, workshops, demos, an install-fest, and a code sprint. It was presented by the world's best Developers, Policy Makers, Sponsors and Geospatial Professionals and included the latest geospatial applications, standards, government programs, business processes and case studies. Topics included mobile platforms, location based applications, crowd sourcing, cloud computing, development, spatial standards, integration of cross-agency data, Spatial Data Infrastructures, Sensor Webs, Web Processing Services, Integration of Open Source and Proprietary Software and more. I published this article on 27 November 2007, under another blog (which has suffered link rot) so I'm republishing here for archiving. Standards and tools for reliable data synchronization in Spatial Data Infrastructure and field based data collection. This article describes the issues and technical solutions associated with Federated Geo-synchronization. Lisasoft aims to contribute to these solutions as part of the OGC’s Open Web Services Testbed 5.2. To strengthen and refine our requirements, we are looking for Agencies which would benefit from solutions identified here. Please leave a comment, or contact me if you are interested. As spatial databases become distributed and collaboratively maintained, traditional database transaction models ineffectively handle modern scenarios. Users require current data from remote agencies. Data may be stored on a slow or unreliable server or behind an unreliable internet connection. Updates may come from remote field workers, trusted external organizations, or general internet users. Identities must be confirmed, updates validated and applied, or rolled back to a previous version. Make a Spatial Data Infrastructure (SDI) fast and robust by caching remote WFSs locally. Provide WFS Synchronization to allow real time data updates between agencies. Ensure interoperability between agencies and applications by proposing required extensions to Open Standards. Ensure wide adoption by providing all components free as Open Source Software. Provide desktop and mobile, field based data collection tools. A Transactional Web Feature Service (WFS-T) provides an OGC standards compliant web interface for downloading and updating vector features over the internet. To date the WFS-T standard doesn’t address version history. Versioned WFS-T enables users to roll back to previous versions, track update history, check differences between updates. A versioned WFS is required to support a cached WFS. Geoserver developers have developed a Versioned WFS-T by extending the WFS-T specification to include standard version attributes. As at May 2007, the Geotools version code is complete, but still in alpha state. It requires configuration web pages to ease operator use, packaging into a release and real world testing. The extensions to the WFS-T specification need to go through the OGC standards process. Security involves: authentication (to verify who a user is) and authorization (to specify what a user can view or update). Geoserver has prototype authorization and authentication code. Access is provided to the level of WFS. Granular access to a layer or a specific feature is not supported. The code still requires refinement, a user interface and integration with the baseline. Clients like Udig, Mapbuilder and OpenLayers require security logic. Some of this will be addressed during the Canadian Geographic Data Infrastructure Interoperability Pilot, due to complete October 2007. A Cached WFS mirrors a remote WFS locally. A Cached WFS-T also caches WFS-T updates when disconnected from the remote WFS. The remote WFS uptime is not guaranteed. The remote WFS connection is unreliable or unable to handle traffic required. Cached WFS-T depends upon the Version WFS-T protocol. An alpha version of Cached WFS (read only) is implemented by Geoserver. A friendly user interface is required to bring this to COTS quality. Minimal development is required to implement Cached WFS-T (with writes) which has a basic conflict management interface. Business rules for managing updates and conflicts from disconnected clients will be addressed in a second development phase. Desktop Mapping offers powerful data manipulation and analysis. There are a number of clients available both proprietary and open source with varying levels of functionality and standards compliance. Extensive map analysis tools from Grass. Access to numerous mapping format and data sources from Geotools. Access to images in a compressed format like ECW or JPG2000. Business logic, views and reports to manage collaborative editing and information from a versioned WFS-T.
Field operators need to create or update geographic data while in the field. Modify, create and delete features and datasets. Interface with a GPS to collect feature information. Synchronize changes with local or remote data-stores via Standards compliant WFS-T protocol. A Tablet or Ruggedized PC provides the same operating environment as a desktop PC. So the Desktop Mapper will port directly to the Tablet. Integration with a GPS is the only extra development required for the Mobile Tablet. PDAs are often used for field work because they are cheaper and smaller than laptops. Along with smaller size they are also less powerful and have less storage capacity. Cut down versions of Windows (Windows CE) and Java (J2ME) run on most PDAs. Investigation is required to determine effort required to port the Desktop Mapper to the PDA and whether alternative development would be more effective. Browser editors efficiently enable data collection from the public or remote workers. Browser clients can also publish public map data. Openlayers and Mapbuilder are working together to produce Open Source, Open Standards Browser Based mapping client. WFS-T editing is supported but needs to include business logic associated with user authentication and access rights. Multiple agencies tend to run multiple technical solutions. This is fine so long as they interoperate through Open Standards. The Versioned WFS-T protocol will be presented to the OGC to be formalized as an Open Standard. Free tools reduce entry costs to a Spatial Data Infrastructure which will maximize participation. Open Source software already provides the majority of the functionality required by this project which means tools can be built for minimal cost. Essential Deliverables are required to meet immediate customer needs. These phases are low risk as the functionality already exists in tested or prototype code. Cached WFS (view only). Builds upon Geoserver/PostGIS. Cached WFS-T (read/write). Builds upon Geoserver/PostGIS. Add simple update business rules. Optional Deliverables are nice to have and involve further development with associated risk. Commercialize product, provide support, consulting and customized solutions. 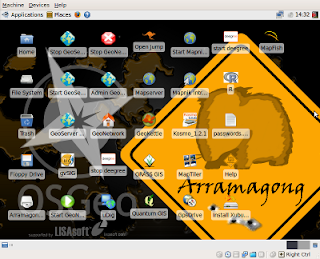 The Arramagong/GISVM GeoSpatial Live DVD and Virtual Machine, which includes a stack of popular GeoSpatial Open Source Applications and is being handed out to delegates at the FOSS4G conference, can now be viewed from http://click2try.com from within your web browser! Click the big Try this application now button. Review the connection test results and fix, if necessary. Either wait for the application to launch or click the Launch App button. Login to the Arramagong desktop using the login credentials in the Quick Start guide in the left pane of the window. You should see the icons for the Geospatial applications on the desktop. You can start and try any application. To save data, you'll need to apply for a free click2try account at http://www.click2try.com/component/user/?task=register. "Arramagong allows users to easily try out the robust, feature rich stack of applications offered by Geospatial Open Source. It is a compelling marketing tool for us organisations who support Open Source." FOSS4G is the international Free and Open Source Software for Geospatial conference, which comes to Sydney, Australia, 20-23 October 2009. 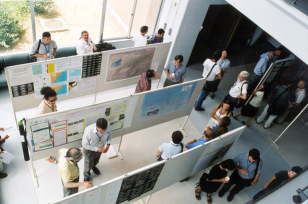 FOSS4G offers presentations, workshops, demos, an install-fest, and a code sprint. It is presented by the world's best Developers, Policy Makers, Sponsors and Geospatial Professionals and includes the latest geospatial applications, standards, government programs, business processes and case studies. Topics include mobile platforms, location based applications, crowd sourcing, cloud computing, development, spatial standards, integration of cross-agency data, Spatial Data Infrastructures, Sensor Webs, Web Processing Services, Integration of Open Source and Proprietary Software and more. click2try is an online Open Source application showroom that helps visitors easily evaluate and use Open Source Software from within their web browser. click2try employs a unique, advanced technology framework, built completely on Open Source software, to provide on-demand, multiuser, concurrent access to enterprise-level Open Source software applications. 350 is the safe upper limit for carbon dioxide in our atmosphere. Published by leading scientists only last year, this target is already in the draft global climate treaty for negotiation at Copenhagen in December. But it’s just one option, along with other competing targets that we now know are dangerously weak. On Saturday October 24th, people all around the world will be speaking with one voice. From the Great Barrier Reef to the Great Wall of China, at over 1500 events in 125 countries, the world will say: 350. By cruising Sydney Harbour on the Southern Swan, you will help to make a powerful statement to the world’s leaders: we want a fair, ambitious and binding treaty that aims for success: restore a safe climate by bringing CO_2 back below 350. After a hive of activity from a team of 20 or so people, we have a Geospatial Live DVD and Virtual Machine with a comprehensive collection of Open Source Geospatial Software. The Arramagong Live DVD was sent to the printers last week and will be handed out to all delegates at the international conference for Free and Open Source Software for GeoSpatial, http://2009.foss4g.org. But probably more valuable than this specific release is the fact that we have automated the building of the LiveDVD so that anyone with a decent internet pipe can build themselves a customised GeoSpatial LiveDVD in 24 hours - a task that used to take months and was consequently a major development barrier. However, there is a non-trivial learning curve for packaging applications for debian, and Java packaging is poorly supported, and there has been a knowledge gap between packagers, familiar with packaging, and developers familar with installing their specific application. So only a few of the popular GeoSpatial Open Source applications are easily installed on Linux. Most OSGeo applications need to be manually installed, and hence packaging for the FOSS4G 2008 LiveDVD and the GISVM involved dedicated developers putting in hero efforts to learn and apply the specific install instructions and dependencies for each project individually. It took months. An installer script is much easier to write than a .deb file, and hence we had many projects contribute. The automated build process meant we could release and test the Virtual Machines often, and involve the whole community in the testing cycle. And as a by product, these scripts are the key element Debian packagers require to build .deb packages, so we should expect to see many of these projects appear in the next Debian and Ubuntu releases. Align with OSGeo Education initiatives to provide training for each of the applications, via documentation, videos etc. and have this material included in the distribution. Target other media, like USB drives. Support targeted releases for specific purposes. (It is as simple as tweaking the install list if you want to create a targeted distribution). And I'm sure there are many other ideas. Tell us about them. Many people worked very hard to get all these applications in place in such a short period of time. I'd like to thank you all for all the help. (I'd try and list you all, but I'm afraid I'd miss someone). a collaborative effort between governments, industry, academia, and communities of interest. committed to the evaluation and where proven, uptake of open technologies, standards and methods. exists to help governments make better, more cost effective and innovative use of open technologies in order to improve service delivery to citizens. focused on openness in order to help agencies achieve more interoperability, independence, resilience and flexibility in their ICT operations. They are currently looking for letters of support for their business plan before Wednesday 14 October 2009. An overview and webcast about the initiative can be found at http://www.cio.sa.gov.au/business/projects/open-technology-foundation . Supporting governments embrace Open Technologies is an effective way to reduce government spending and I strongly support this. In particular, Open Technologies facilitate cost savings by spreading development and maintenance costs between multiple agencies, both nationally and internationally. However, uptake of Open Technologies is often hindered by specific project purchasing guidelines which focus on immediate deliverables. People are not paid to spend the extra effort required to make an application easy to share. I suggest the business plan also focus on the development of purchasing guidelines which encourage Open Technologies and collaborative approaches. Steve Schmid, the key person behind the initiative will be leading a FOSS4G in Government Birds of a Feather session at the FOSS4G conference in just over a week. Look out for him if you are going to the conference. Many FOSS4G workshops are close to full, with one workshop already at capacity. http://2009.foss4g.org/workshops/ People wanting to learn about Geospatial Standards, Geospatial Open Source Software and Business Cases should sign up soon to avoid disappointment. 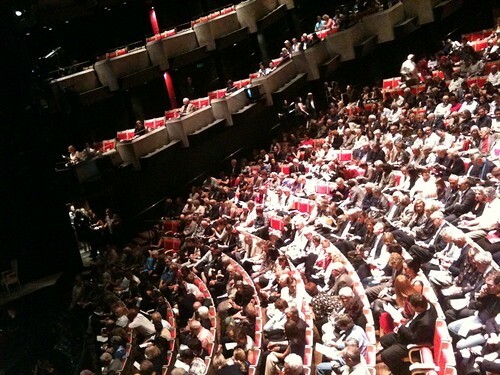 One of the perks of running a conference is that you are occasionally given free tickets to shows, or harbour cruises or the like, in the hope that we might write a blog like this and tell all our international friends to go see the show. So Mark Leslie, who has been flat out sorting out workshops and other things, has volunteered to check out the "Wicked" musical currently running in Sydney. Thanks Mark. What windows installers should be on the FOSS4G Live DVD? The Arramagong Live DVD / GISVM email list has been running hot last week, with ~ 15 people helping write install scripts for projects in order to meet our feature freeze deadline tomorrow, Monday 7 September. PostGIS ,GeoServer ,Mapserver ,GRASS ,Qgis ,gvSIG ,uDig ,Open Layers ,GeoNetwork ,Open Jump ,Deegree ,GpsDrive ,mapnik ,MB System ,pgRouting ,52 North Sensor Observation Service ,Mapfish ,Marble. GISVM is a Free(dom) and ready to use anywhere Geographic Information System Virtual Machine. Based on the amazing Virtualization technology it can be used on almost any operating system environment and is intended to be a hassle-free installation option for anyone that needs a ready to use GIS solution. 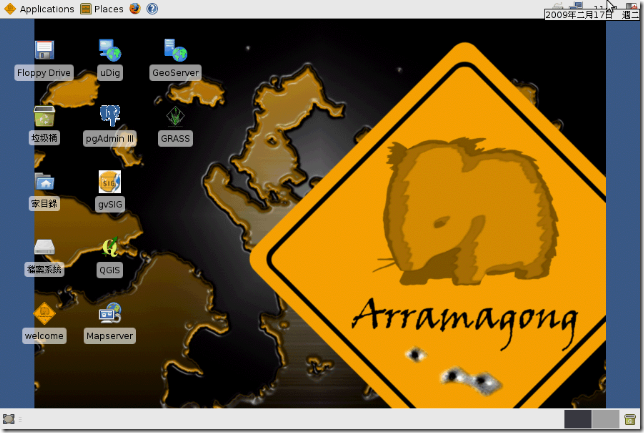 The Arramagong Live DVD provides a stack of most of best Geospatial Open Source software, pre-configured with sample data. It is based on the XUbuntu linux operating system and also contains windows installers. A FOSS4G 2009 release of Arramagong will be given to all delegates at the FOSS4G conference. It has been built by LISAsoft in conjunction with the Open Source Geospatial community. I attended a briefing about Australia's Digitial Regions Initiative which is co-funding projects to help regional education, health, and disaster response projects. (previous description). The Expression of Interest, due 14 September 2009, is aimed at identifying potential projects, and giving parties the opportunity to find each other and collaborate on the final proposal, to be lodged by 14 October. I asked whether it was in scope to propose an Open Street Map style application, which facilitates community collection, cleaning, and collaboration around spatial and attribute data. This was certainly considered in scope, if the value to communities could be demonstrated. Value is based upon the number of people serviced, the value presented to each person, and whether the service is filling an existing gap. The initiative is expecting to fund 50% of multi-million dollar projects. 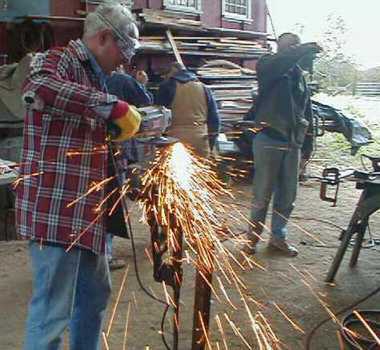 However, smaller projects will be considered, so long as they can demonstrate appropriate value. External funding sources (and I'm specifically thinking about co-funding with international government programs) would be acceptable. The Arramagong Live DVD, GISVM, and OSGeo Live-Demo projects are collaborating to create a set of simple, automated install scripts for a wide variety of Free and Open Source GIS projects, and we're calling on each project to help us write a script for their software. Projects that can write their install script this week will be included on The Arramamgong Live DVD which will be given to all delegates at the FOSS4G conference. The scripts should cover the installation and configuration of each project into a base Xubuntu 9.04 system. Separate scripts can optionally cover data, demos and tutorials. As a bonus, these scripts are exactly what packagers require to bundle your project into Debian and Ubuntu, so you will be taking the first steps toward getting your project into a Linux distribution. echo "udig-1.2-M6.linux.gtk.x86.tar.gz has already been downloaded." echo "udig.sh has already been downloaded." echo "uDig.desktop has already been downloaded." echo "data-v1_1.zip has already been downloaded." echo "udig-1.2-M5.html has already been downloaded." echo "uDigWalkthrough1.pdf has already been downloaded." echo "uDigWalkthrough2.pdf has already been downloaded." As we are still bootstrapping the packaging project, and as we are very short on time before feature freeze, manual steps can be included as comments in each install script, and can be automated by a project member, or packager at a later date. And help is available on the Live-Demo mailing list via Cameron Shorter, Stefan Hansen, Ricardo Pino, Hamish Bowman, Alex Mandel, Massimo de Stefano and others. The Australian Department of Broadband, Communications and the Digital Economy is offering to co-fund government programs under its Digital Regions Initiative. Among other things, this would be an idea way to fund projects which support crowd sourcing of map features to efficiently support emergency and disaster response targets. increase the use of digital technologies to improve emergency and disaster response both within and across state and territory borders. LISAsoft would be happy to help government agencies on a technical level in putting together a response for the EOI, due 14 September. An early draft of the FOSS4G program has been released in response to some delegates wishing to book flights and accommodation early. While there may still be some minor changes to the program, we are not anticipating many presentations to move from one day to another. Yves Jacolin has sliced FOSS4G website hits to determine the number of FOSS4G attendees per million people, broken down by country. From this, you can get a feeling for the most OSGeo tolerant populations in the world (distorted around Australia due to the conference location). Canada looks preferable to the US. I wonder how much the Canadian GeoConnections program is responsible for Canada's strong OSGeo industry. There is a lot of interest across Europe, so FOSS4G 2010 should be a crowded event. Africa seems to have learned all they need to know when FOSS4G attended Cape Town last year, and won't be heading to Australia in force. The FOSS4G conference is famous for its community driven, extra-curricular activities and wiki pages are now open for community members to define these activities for 2009. So if you want to get more out of FOSS4G than just listening, if you have a topic you want to discuss, a message you want to share, a product you want to show off or you want to network with like minded people, then please consider adding your name to one of the following activities. The Free and Open Source Software for Geospatial (FOSS4G) conference, coming to Sydney, Australia, 20-23 October 2009, attracts presentations from the world's best Developers, Policy Makers, Sponsors and Geospatial Professionals in the area of geospatial applications, standards, government programs, business processes and case studies. Topics include mobile platforms, location based applications, crowd sourcing, cloud computing, development, spatial standards, integration of cross-agency data, Spatial Data Infrastructures, Sensor Webs, Web Processing Services, Integration of Open Source and Proprietary Software and more. Key Australian industries will gain access to new data, technologies and services through the funding of a major research program in spatial technologies, announced by Senator Kim Carr today. With a total budget of $180 million, the new Cooperative Research Centre for Spatial Information (CRCSI-2) involves over 100 organisations including from government and the private sector coming together with universities in an eight-year joint venture. “The new CRC SI will help us to remain internationally competitive and capitalise on rapid growth in the spatial industry. The CRC Program’s investment in this industry will deliver tremendous benefits to the nation.” Said Mary O’Kane, Chair-elect of the CRCSI-2 Board. “Through this funding the CRC Program has recognised the tremendous potential spatial information offers to the Australian economy,” said CEO Dr Peter Woodgate. The spatial information industry currently contributes an estimated $12.6 billion to national GDP. Direct outcomes from the CRCSI-2 are expected to deliver a further $305 million to the nation if emerging developments can be leveraged for Australian industry. The wider benefits are far larger. Over 90 end-users, mostly small and medium companies, will participate in the program to direct and speed delivery of research outcomes. “Our end-users give us a tremendously strong picture of the technology and services the marketplace needs,” said Dr Woodgate. Health – Preventative medicine policies will be improved through the way in which spatial information can show patterns of disease which are otherwise undetectable. CRCSI-2 will spatially analyse data for early detection of colo-rectal cancer and childhood leukaemia. Energy and utilities – Unmanned air craft will monitor powerlines with laser scanners to get timely, accurate knowledge on the condition of power infrastructure which will improve safety and reduce costs for consumers. Sustainable urban development – Planning, transport costs and “living affordability” in our cities and towns will be assisted by spatially understanding what makes good urban areas work. Agriculture and climate change – Farmers will have more precise information to guide the planting, treatment and harvesting of crops due to spatial precision agriculture. Scientists and land managers will be able to monitor landscape changes more closely, particularly important given the widespread effects anticipated from climate change. Though its strong international linkages, the CRCSI-2 will also be targeting overseas markets to deliver new technologies and services. “Our fledgling industry will have a great chance to gain international prominence through this initiative,” said David Hocking, CEO of the Spatial Industries Business Association which is also participating in the CRCSI-2. “In its first incarnation, the CRCSI helped to position Australia as a world leader in the development and use of spatial information technologies,” according to Warwick Watkins, Chairman of the Australia and New Zealand Land Information Council. Spatial Information is at the core of a number of platform technologies and services, from traditional surveying to contemporary technologies like GPS and location-based services. It describes the location of objects in the real world and the relationships between objects. Practical applications include environmental monitoring, GPS services, customer relationship management and the management of natural resources, biosecurity, assets, land and emergencies. The spatial information industry contributes up to $12.6 billion to Australia’s Gross Domestic Product.